Do you think you can find...? Going from one country to another is probably the easiest way to lose yourself. Whether that is your intention or not. Particularly in times of turmoil. People were doing their best to survive, whether in their new circumstances or in their old surroundings. People tried to fit in in their new places and people rejected identification with their old places. And they changed their names. They changed their given names and their surnames. They took names that reminded them of who they were and names that were meant to deny who they were. They took names that represented what they wanted to be and they discarded names that the police or the army were looking for. They took names that fit their new societies and rejected names with negative connotations in their new societies. They translated their names, they shortened their names, they simplified their names, they made up their names. And some simply took the names of the husbands they never really told us about. And in lands with different alphabets, the spelling changed. And is some of these new lands and new times, spelling began to matter. And those who live in places where spelling matters cannot begin to imagine how their own names look in some other lands, often with other sets of letters. Transportation and communication were no small matter and making ends meet was more important than staying in touch with those who stayed put or with those who went somewhere else. And all this was true before the Holocaust when at least people knew more or less where to look. So what about this uncle who went to Eretz Yisrael? Or the aunt whose daughters married and went to Palestine and who knew what they were called even in Europe? Well, some of them really disappeared - either here or at their next destination or the one after that. Some really covered their tracks. But most left traces and some of those traces can still be found. It is true, you probably won't find someone if all you know is "Moshe Gold-something from Poland." It is true that the government, immigration and settlement sources may not be of much help. Knowledge has always been power and the organizations that used to say "security" now say "privacy." The government and the organizations may tell you that they need more information than you have in order to help you and that may be true when you are looking for common names. But all too often, there is no real question of identification, just a reluctance to part with the power that comes with knowing what someone else wants to know. But sometimes you get lucky. Or sometimes someone knows where to go and how to look. The Israeli government has no naturalization process for Jews, who are automatically entitled to citizenship. But that was not the case during the British Mandate. Anyone who acquired citizenship under the Mandatory Government went through a process and a file was opened. The early files were lost, perhaps destroyed by the British themselves, but the files from about 1933 exist in the National Archives in Jerusalem and the microfilm index is open to anyone. More recently, these images have been scanned and you can browse them on the computers in the archives' reading room. and the quality is way better than the films. 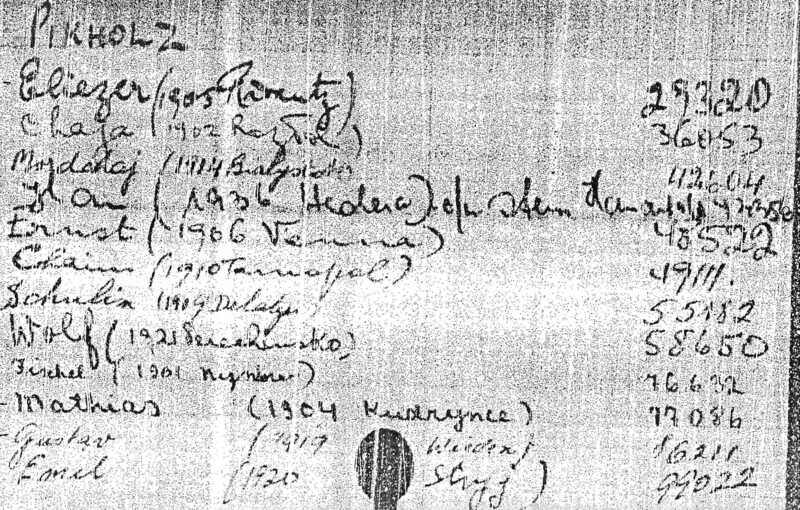 The frame on the right shows all twelve of the Pikholz citizenship files - and for our convenience the British organized the card file with all spellings together. The information on the card file is name, year and city of birth and file number. Sometimes all the information actually appears. Of the files in the idex, about 70% actually exist. If the file is over seventy years old or if you can demonstrate that you have a right to the file (a descendant, for instance) you can get a copy. The file will generally have some information of a personal nature (including wife and minor children) but generally little genealogical material. There is usually a passport photo and date and method of immigration, including the name of the ship. For further information on this and other sources, contact Israel Pickholtz, Solutions.